This Thursday marks the debut of Andres Serrano’s latest show, “Body and Spirit” at Edward Tyler Nahem gallery in New York. On view will be “Piss Christ,” Serrano’s 1987 piÃ¨ce de rÃ©sistance that seems to have been causing apoplexy in a number of politicians, religious leaders, and FOX News commenters, who then quickly regained their powers of speech. 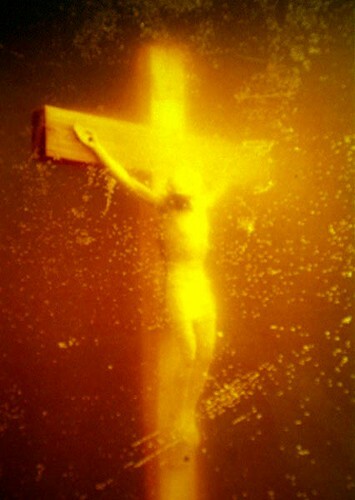 Piss Christ is public property. It was paid for with public tax dollars. President Obama should take back Piss Christ and have it destroyed. If President Obama does not order these co0nmon sense and prudent steps, the Christian community may well become provoked into uncontrollable spontaneous violence. Remember up to six mortars and rocket propelled grenades are allowed in spontaneous attacked.